SURPRISE SALE!! ENJOY 15% OFF ALL ORDERS. USE CODE: SPRING2019. Offer may not be combined with any other offer. Orders shipped within 1 week. Pricing in USD. In a rush? With the Fantom Wallet's integrated quick-access card slot, you can easily withdraw your top card with your thumb in one swift motion. The ultimate slim solution for your everyday carries. The Fantom 7 Wallet is only 0.3in (8mm), just 0.08in (2mm) thicker than the cards it's holding. Simply put, this is the thinnest wallet ever made. 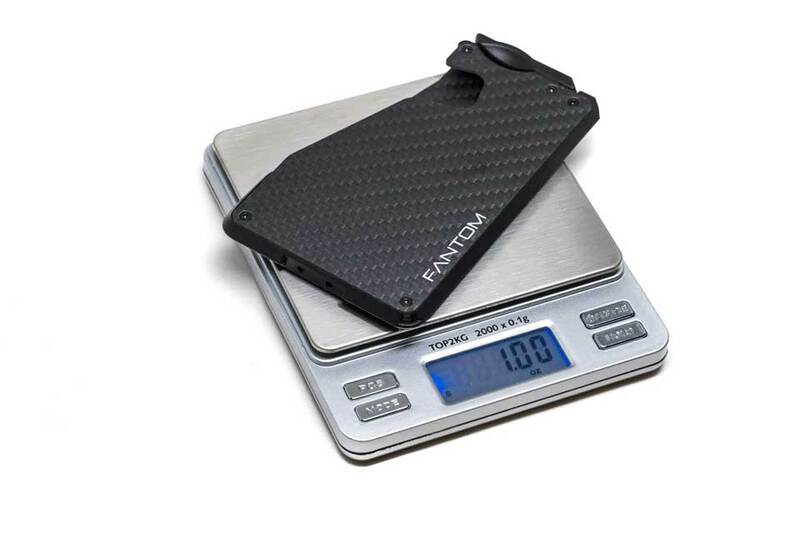 The Carbon Fiber Fantom 7 Wallet weighs exactly 1 ounce. Using the same materials as aircrafts and race cars, we managed to make the Fantom the same weight as a single slice of bread. With the cards retracted, the Fantom Wallet will dampen the signals, reducing the risk of being activated, selected and copied. Once the lever is pulled, the card will be exposed and ready to use at the transit turnstile or making a tap payment all without removing the card from the wallet. Not applicable to the carbon fiber version. Easy access doesn’t mean unsecured. Even with the cards fanned out, the Fantom Wallet is carefully engineered so that the cards will not fall out. The cards come out only when you need them. Sleek. Ultra-lightweight. Secure. Fantom Wallet. For all of your everyday carries. The Fantom Wallet with the coin compartment holds coins up to 2.8mm in thickness. The coins are secured in using the thumb lever as a door. In addition to coins, the holder can be used to store spare keys, SD cards and USB drivers. Store your bills securely with the strong and light Grade 5 Titanium money clip. 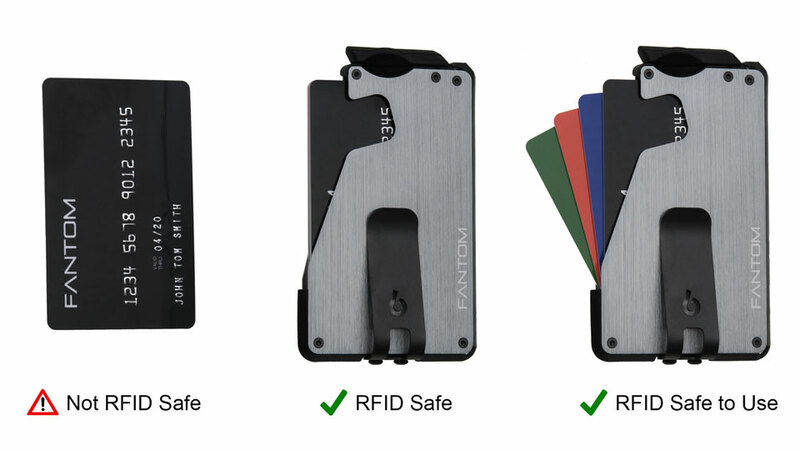 The money clip includes a pair of screws and a hex key to install onto your Fantom Wallet. It can be installed on either the front or the back side of the wallet. It is also available in an anodized finish in Black, Blue, or Gold. Find the right configuration that suits your needs. 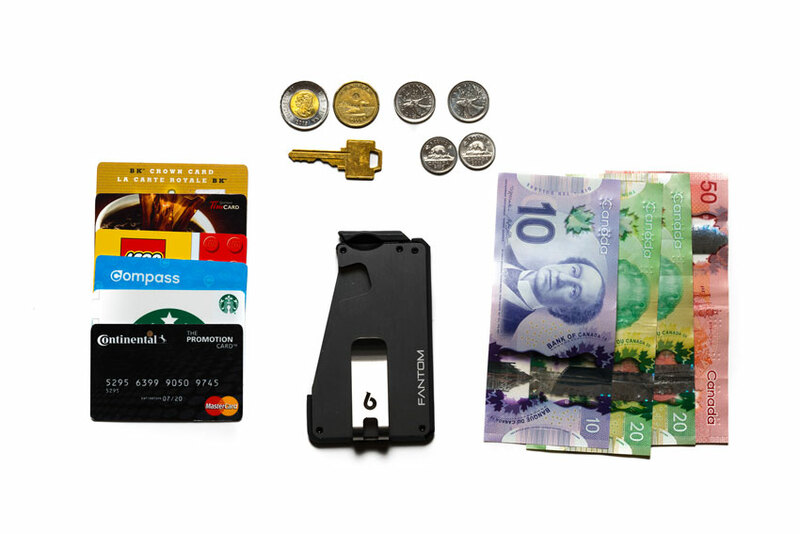 The Fantom Wallet can hold cards, cash, coins, and more. Everything is great besides the coin holder. To access coins I have to fan out the cards & bang the the wallet for coins to slide out! First of all, I'm not a minimalist, but there are times when I look at how I've solved a problem, and I can't help but think that there's a better way to solve it. Prior to purchasing a Fantom Wallet, I had been using a soft carbon fiber money clip, which help my Credit Cards, and also my bills. About 2 months ago, I dropped my money clip in a convenience store, and all of the credit cards fell out, and scattered on the ground. I found all but one of those cards, and while I was able to get a new card issued to me, I wanted to prevent this from happening to me again. So, I was trying to duplicate this functionality of the money clip, but I wanted something that was safer. I ordered the Fantom Wallet, and found that it is a beautifully manufactured object. The wallet is very securely built, and the credit cards fit in perfectly. The Fantom wallet provides me with extraordinary protection from accidentally losing my cards, and/or my money. But, this wallet does take a little getting used to. For example, while the wallet holds the cards securely, it can sometimes be a little difficult to remove one card, from within the stack of 8, 12 or 16 cards. In addition, the money clip is pretty rigid, and so it can also be difficult to slide my bills under the clip, so that they are "clipped in" and unlikely to get lost. So, aside from these two little annoyances, I find the product to be well engineered, innovative, and secure. I've gone through a few wallets most recently and this was by far the best one I bought so far. Doesn't get dinged or scratch up and is very light. Forced me to get rid of unnecessary cards and reorganize myself which I'm happy with and is very easy to use. I would recommend this wallet to anyone looking to organize their life better and for a great user experience. Bought the 10-card wallet with money clip. Have used this product for over 6 weeks -- it has exceeded all my expectations. Completely replaced my old traditional wallet. Sleek design allows me to carry my Fantom in my front pocket, eliminating the old wallet bulge in my back pocket -- much more secure (especially when wearing jeans). Really like the fan-out feature. Keep my credit card as the last card in the stack, making it the easiest to get out when using the fan-out lever. Keep my military ID as the first card, which I retrieve the most as needed to get onto the military base where I live. One-handed retrieval using the thumb works as advertised -- very simple. All cards stay secure in the wallet -- even when holding less than the full complement. One of the best purchases I've made in a long time. Well built unit and light weight. The money bills needs to be folded twice before sliding under the clip, otherwise it hangs over the sides a bit. If you have bigger coins like the two dollar cdn coin for ie, it can be a little difficult loading and unloading, as the lift release doesn't open fully 90 degrees. It appears it's only meant for a few coins. I have put over 10 cards in this wallet and it's a snug fit and I was never worried about cards being loose or falling out. Overall a well built unit. I will update my unit and avoid the coin holder. Thank you Fantom for your prompt customer service! Very pleased in how I was treated. Amazing Wallet & Customer Service! I ordered my Fantom Wallet a couple of months ago, and so far it has been an amazing wallet to carry! It's comfortable and doesn't crowd your pocket. The coin holder has been a smart addition to the wallet, I store around 6 quarters inside it for whenever I need spare change. Not only is the wallet a piece of art, the customer service is amazing! They have helped me with my issues and questions with responses in less than 24 hours. I reccomend this wallet to anyone who is looking for a good product and company to support. I've always had big bulky wallets but when I switched to the fantom it changed my mind on "minimalist" style wallets. They ONLY thing that would make me more happy, and 100% love it is to offer it in an all metal form, something nice like titanium. I was kinda disappointed when it showed up and I realized it was all plastic. I've bought many minimalist wallets over the past few years, but after using the Fantom for the past couple of months, I'm hooked! I got the coin holder version and while it doesn't hold a ton, it's very useful. The idea of minimalism after all is to minimize your EDC, so everything you carry has a defined purpose. The Fantom takes a little practice to remove the front card with just your thumb but after a couple of days, it's a snap. Don't believe other reviews that say it's hard to get to a card in the middle - just fan, slide the stack over to reveal the card you want, and pull. Just that quick! After all, think about how long it takes to pull a card out of a leather bi-fold wallet. I have a magnetic door card that I use for work. To prevent having to pull it out every time I need to swipe the door lock- I simply put it in the back of the stack. I pull out my wallet, fan the stack and press my wallet to the card reader. The rear card fans out more than the rest of the stack, exposing more than enough to get around the RFID blocking capabilities without removing your card. The Fantom is a little pricey, but definitely worth it. Take it from someone who's tried them all! I got the Carbon Fiber wallet and it’s better than expected. The customer service is by far the best I have seen! Do not hesitate to buy this product!! 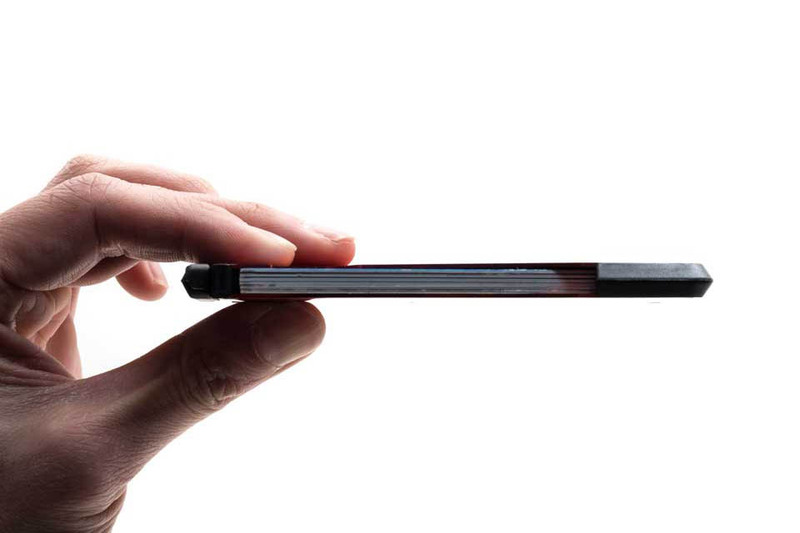 It holds 8 cards easily and it’s incredibly slim and well-designed. The cards could separate a little easier; it’s kinda tricky to get out one of the middle cards. I love the carbon fiber material and design. Great job! I can't really recommend the coin holder. I haven't had much use for it, and it makes the wallet just a bit bulkier. It does work, though, so if I ever take to carrying a micro-SD card around I'll have a place to put it. The wallet itself is great! The material is thin but sturdy and it's a lot lighter than the wallet it replaced. The fan feature gets used constantly and getting the top card out is pretty straightforward even with one hand. I've been surprised by how often I use that. I love using this wallet, I am always getting reactions from people as it is so different from conventional wallets. They always ask me if it is any good and I always answer the same thing: When I first got my Fantom wallet it was a bit strange folding my notes to put in the money clip, but I got used to it very quickly. The cards did not slide into the case instantly at first but I had read in several places that it takes around 2 weeks to 'wear-in' but in my case, it took only a few days before all of my cards were easily being removed. However, this is not to say that they fall out in any way! al of my cards can be removed easily by me, but are very secure from falling out, even with a hard shaking (yes I have tried it!). In summary, it is a fantastic wallet, very slim and easy to carry, gets a reaction, works perfectly and is incredibly safe. Note: I have the Carbon Fibre, 4-7 card, Titanium money clip and no Coin Holder. This takes all of the cards and cash that I need (I like to travel light). 5*! I hope this helps people to decide if they are on the fence. Real carbon fiber. Was surprised by how thin it was, but certainly well manufactured and tough. Quality parts, tight money clip, minimalist. Cards don’t fall out. I love it. The product is 100%as intended. Had an issue with my mailbox but they helped me find my package and were very helpful and responsive! A year ago, my conventional leather wallet was stolen by a pick pocket of course from my back pocket a place I have been carrying my wallet for the last 50+yrs. So came the quest to find a small lightweight wallet for my cards/money. I pre-ordered the Fantom and waited for it to arrive. I had my reservations. Will it work as slick as the video's described...will it work as great as the You-tube testers indicated.. My answer is YES...I am not sure if I qualify as a product spokes person but I have had in the last year about a hundred people ask me about it.. It is working great.. I love it...it is securely in my front pocket. Shows no sign of wear.. The only thing that has happened is one of the screws has gone missing.. I have sent a request in to see if or where I can get a replacement. I have had the Carbon wallet the first day it came out and love it . Works great. I bought the titanium clip but took it off since I like the slim look and feel. Loved it so much I recently bough the silver aluminum so that I can alternate . I have been using the wallet itself for the past couple weeks and it is a head turner at every checkout and a good conversation starter. I am very happy with the wallet, after the break-in period it worked like a charm with no resistance on the lever. My only gripe is with the "Fantom" lettering on mine is starting to rub off, but this may just be due to my carelessness. Overall I am very happy with the wallet. Surprisingly easy to access cards in wallet. I love the sleek design and portability. Very nice wallt overall. I ordered the Fantom 13 Carbon Fiber w/o money clip. This is the absolute lightest and thinnest wallet I have ever seen or owned, I love this wallet. I didn't do enough research on this wallet and just recently realized it wasn't RFID blocking, no problem, I emailed the Ansix team and they swapped it out for a black aluminum no questions asked. The only thing that really sucked was having to send in the carbon fiber wallet and wait on the black aluminum and revert back to my old heavy minimalist wallet. I will never purchase another wallet, unless it is a Fantom wallet. The only thing I would probably change is adding another wallet to the lineup that would hold about 15 cards, other than that, no changes at all. This is by far the best wallet on the market today. Best investment on a wallet I've made. Looks good, very light... sometimes forget it's in the front pocket. Would definetly recommend this product. I have had may wallet/ card holders .... this is by far the best !! It is everything you want and more ! Do waste time thinking about it ! Just order it .. you won’t be sorry ! I've purchased the wallet a couple of months ago and it's just brilliant. Brought the carbon fiber with money clip and coins compartment. The coin compartment I use just to make the wallet a little heavier, the money clip is doing a grate job holding the cash together. All the cards are safely kept, not falling out of it and the access to them is done with ease. All together, a good quality product, nicely built, stylish with a little wow effect. I just love it. Oh, had some issues with the payment but the Fantom team replied fast to any questions, after all it was a pleasant experience buying it online and it arrived all the way to the UK in about a week. Thank you Fantom team. First of all the Fantom Wallet is just a better product functionally. As opposed to other minimalist wallets, the Fantom has a much better form/function that any of the others I've tried. The Fantom is easy to operate with a single hand and after years of using the Ridge wallet that is a clear upgrade. I actually purchased the Fantom after my wife finally said after all of my cards went all over the ground for the second time in the same day, " You need to get a better wallet". The money clip, the card fanning function, all just work. The only thing I can say that would want that is not included in this version is built in Tile location. Second, the materials, fit and finish are as one would expect with a premium product. I splurged for the Carbon Fiber and was really glad I did. The wallet has a professional and indestructible look and feel that exceed my expectations for the price. The Money clip is both durable and gives the perfect accent without affecting the ease of use. At this point, I honestly can't image owning another wallet. Like I said above, I can only think of two features that I would want in any future edition of the Fantom, integrated Tile location and one big enough to manage a passport or two. Thanks very much for your outstanding craftsmanship and delivery. Good luck in the future, Brian M.
Wallet is as described, very thin and super light. Cards are kept well secured and fanning feature is awesome. Looks super cool too and fits my needs perfectly for a minimalist style wallet that's thin, light and fashionable. Five Stars! After years of using another brand of minimalist wallet which I won't name as they are a great product as well, I've gotten to the point that it is just too big in my pockets and was looking for something else despite the fact that I really loved the protection and ease of access of my previous brand. In general, I just didn't need all that much anymore and outside of building access, IDs for work and life in general, a couple of credit cards, insurance, conceal carry permit, and my guilty pleasure (a Dave and Busters card) I didn't need all that much. I went on the hunt and after trying a bunch of minimalist wallets from the likes of some big names and kickstarter companies I stumbled upon the Fantom. Initially, I was turned off as much like a few other brands products, it didn't look like much and the pictures don't do it justice as from some angles it looks cheap. So glad I decided to give it a try as once in hand it felt solid and totally up my alley. Small, lightweight, RFID shielded, and the fanning is just an extra. A little pricey sure, but after just two days it is my go to wallet. Took me weeks to try out some of the other brands products before I sent them back or gave them away. Not here. This is my new daily carry and while I do have a 13 now, I may end up ordering a 10 for when I'm on vacation and need something smaller or just need a color change on a night out. Debating on the Carbon Fiber as I love the look but it doesn't seem to be RFID shielded which is a big issue in my area right now. Currently rocking a plain silver 13 with the Titanium clip. Looks professional yet stylish at the same time and the small gap for a few extra cards is actually welcomed as I can add a business card or gift card in at will without worrying about having a completely full wallet. Currently have 10 cards in there but since not all are embossed, I have plenty of room. My only real "complaint" or "critique" is the plastic lever. Seems solid so far yet, longevity-wise, not sure. No worries yet though so that is a big plus in my book even after I have already dropped it. No damage at all. Bottomline, great job Fantom team and this is a great minimalist wallet so far. Well designed, yet simple product that other companies just can't seem to iron out. I can name names of the ones I've tried but don't want to put those companies on blast in a public forum. Assorted musing: Not really looking for compliments from others but the fanning is an eye turner. Excellent product. Durable and not bulky. I love this wallet!! It's lightweight. Just excited to put more cards into it!! Fashionable and functional, all in one light package. The Fantom Wallet is really fantastic so far. Build quality is solid, fanning mechanism works great, and plenty of room for all of my cards in the Fantom 10. I get a lot of remarks about the wallet when I use it, from both friends and strangers. The Fantom is fashionable and functional, all in one light package. I originally had ordered the Fantom 13, found it too large for my liking, and asked to return it for a Fantom 10. Customer service responded in just a few hours saying "No problem, we'll ship out a replacement Fantom 10 in exchange for the Fantom 13". No difficult hoops to jump through, no fine print, just Ansix striving for customer satisfaction. Really impressed with the wallet, but even more impressed with the customer service I received. Thanks Ansix! I ordered the regular carbon fiber version. I need something that I could put my work badge in and still be able to scan in without taking it out. I keep 8 cards in mine, and it works great. It is so slim, that I sometimes forget that is in my front pocket. The only concern is that the carbon fiber scratches pretty easily. I have to say, this wallet has good quality to it. I bought the carbon version. I can get all my cards in to it with one or two places to spare, for future cards. I would recommend it again with no hesitation. I had high expectations for this wallet and I have to say they were exceeded when I took it out of the package and started using it. I love how unique it is. There are so many wallets out there to choose from and I did a lot of searching and research before coming across this one. After watching several videos and reading many reviews I decided to make the purchase. I am so glad I did. I highly recommend this wallet to anybody looking to think outside of the traditional leather "box." If you are on the fence, make the final decision to purchase this wallet. You will be happy you did. It is worth every penny. The only thing I was surprised about was the weight. I thought it would be heavier. I wished it would have been at first, but after carrying it around for a while I am actually glad it is not. It is the perfect weight, not too heavy and bulky, but not too light to where you forget it's there. Great job guys! I can't wait to see what you come up with next. I will definitely purchase updated models in the future. I really like this wallet overall is solid but I wish would have some small improvement to it. I wish the Aluminum material would be a bit more robust even if that means more expensive, I don’t mind paying more for extra quality. The plastic surrounding the wallet that drives the fanning system gives me some doubts but it could be cuz I’m no a fan of plastic too much. Lastly even though is kinda explain in the FAQ. Be careful how many raise cards you have cuz that could affect the wallet. I got the one that holds 10 but realistically holds 7 due to 4 being raise cards. Overall that is just small personal comments I have and should no deter u to buy it. The wallet is solid and it is a great talking piece and if looking for a nice way to keep your wallet organize this is the wallet u should get. Nice wallet, good replacement for Traditional wallet, holds and fans Cards nicely, thin none raised card actually works better on bottom, always get compliments On this wallet, 4 stars because For the price, money clip should Be included ( especially if this is Going to replace old wallet system) great wallet! Absolutely love this wallet. Took roughly 2 weeks to show up at most. I got the regular 4-7 card holder. I recommend putting your drivers license somewhere in the middle as it is thinner than actual cards that way it gets caught when fanning your cards. Everyone I show asks me where they can get one. I had one of the sandwich hard holders with a strap and it wasn't bad. However, the Fantom I got is a lot more convenient; primarily because of the lever that fans the cards out for easy access. If you look inside at the bar that moves against the cards it has different step levels that create the fanned out results when the lever is pushed up. I think that cards are getting thinner these days, for example; an Amex card is thicker than a driver's license or a bank debit card. Therefore, I would like to see Fantom create a few different bars with different depths to accommodate or make the bar steps adjustable. Great overall wallet. I ordered the coin holder version with a 6-10 card capacity. I was initially upset over how much wider it made the wallet (about 4 credit cards thicker). But once I loaded it up with cards and coins, its size felt perfectly fine when placed in my front pocket. The coin holder holds about 6 quarters in there and I was surprised by how often I found myself digging into it to grab a water or soda from any random vending machine. When I'm paying with cash, I usually take out an extra quarter or two, that I typically wouldn't have on me with my normal bifold wallet, to round up my change to get that full dollar back. The coins do rattle when in the holder, fortunately it doesn't bother me too much but I can see it being annoying to others. It also looks great with the gold money clip + black wallet combo. Tip: Don't overload your wallet with cards, it scratched my metal credit card when tried forcefully inserting the cards in it. Keep it one card less from capacity. Best wallet so far. Realy good quality i love it. Very good quality. Love the cards being able to be fanned out. Easy acces and easy to get to but held very secure. The perfect front pocket wallet. I get tons of compliments and everyone wants to know where I got it. Doing my part to spread the word! Nice Job! Thank You! This wallet is simply the best answer for all the cards you need. Designed smartly and moreover it looks good. It delivers as expected. Good product! B U Y N O W !